Three bedroom, Two Bath condo close to the pool & hot tub! 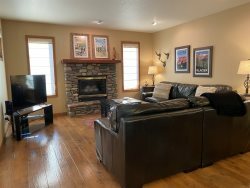 The main level is equipped with hardwood floors, a gas fireplace and a large flat screen tv. French-style doors open to the deck that over looks the pool, hot tub and creek. The large upstairs Master bedroom has a Queen bed and pullout double couch, flat screen t.v. and a newly remodeled private bath with tiled floor and shower. The second bedroom downstairs has 2 twins and the third has a queen bed. Each bedroom has a portable air conditioning unit in Summer. Mountain Harbor is in a great location on Whitefish Lake; only 6 miles from The Whitefish Mountain Resort for Alpine and Nordic Skiing in winter or in the summer enjoy hiking, mountain biking, zip lining and Tree Top Walks. A 2 mile walk on the new footpath/bicycle path is a very popular way to access Downtown Whitefish for a morning coffee or breakfast at one of the many local restaurants. Fine dining or family dining is in plentiful abundance in Whitefish! You can view our Top Picks by visiting our Local Area Guide for staff suggestions on things to do and places to eat and don't miss visiting Glacier National Park, a short 35 minutes away from Whitefish with all the hiking, biking, water rafting, fly fishing and family fun you could ever dream of. Mountain Harbor is a family friendly lodging choice for reunions and weddings. With around 20 condos of varied size in one small resort there's plenty for everyone. Mountain Harbor has it's own outdoor swimming Pool open in Summer and an outdoor community hot tub open for Summer & Ski Season. The Mountain Harbor beach is one of the best on Whitefish Lake with 405' of private lake access. Fire pit at the beach and a tennis court and basketball hoop are some other amenities to please all ages. *Pool & Hot tub open during Summer. Hot tub open for Winter/ ski season. Very responsive. We were unable to locate the garage code and staff member called me back within the hour.